All this to say that I too have decided to attempt to design a board game or two. So far in my life, I’ve always attempted to make things that I was fascinated with, in order to better understand them and to see just how difficult it is to do simple things. I’ve not always been successful, but the times I was (making beer, video games, writing), I think I did it very well. So, let’s see just how I well I do at that boardgame design thing. How do you start a designing a game? There’s a debate in many circles that can be summed up by theme/setting or mechanic first. Do you start designing a game because you have a really neat idea about a mechanic and the theme/setting can come later or does it start with something you saw, a great theme or setting for a game, to which you’ll bolt some mechanic later, meaning that you’re more concerned with the feel of the thing than having some cool mechanic? For example, did you come up with some clever twist on the “I Split, You Choose” mechanic or you really want to make a game about the spread of infectious diseases or about being a rail baron in Switzerland. To me, this almost sounds like the old debate between lyrics and melody and, frankly, sounds more like a question of taste than anything. Coming to this from the video game industry, I have a slightly different way of looking at things. I like to start with a core idea, a gameplay space more than just a mechanic or theme. Once I’ve settled in the space I want to explore, I find that theme and mechanics will most of the time suggest themselves or at least a clear direction will define itself. It is also useful to have a core idea as you can use it as a gauge to decide whether or not a mechanic needs to be there or whether the story you’re trying to tell is still being told. Core idea is different from theme in a simple way: for the most part, theme is strongly suggested by events, settings or story. For example, a game about a hero who overcomes great odds. As a theme, this is very strong (if over used). Theme doesn’t necessarily suggest a specific time period, but it does tend to. Core idea is more of a concept that you want to explore. For example, one of my (many) unfinished game’s core idea was trying to figure out what it meant to have insider knowledge, especially when it was incomplete. You have one piece of the info and the other players might or might not have the others. This becomes very interesting when you tie in it with a trading theme, so that the players each have some info about the potential demand for a specific type of good. See how the core idea is then tied to the theme? Mechanics, in this case, would come next. For this game, the core idea is a confrontational coop game, which simply put means games which the players must cooperate else they will fail, but only one player will win in the end. One will win or all will fail. The best example of this is Republic of Rome, an old Avalon Hill game that was republished by Valley Games. 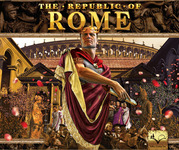 The game simulated the Senate of Rome, with the players having to work together to protect Rome while simultaneously trying to claw their way up the ladder and attempt to eventually become the most powerful family. If they didn’t work together, the barbarians would run over Rome and they would all lose. The fun part of the game is being able to orchestrate a situation in which you can back stab all the other players to grab the win for yourself without causing the game to collapse. My design goal is then to take the core idea and feeling of Republic of Rome without having the length and complexity. How do you make simple mechanics that support that goal? And more importantly, what theme or setting do you use to represent that idea best? The obvious setting, and the one that was rejected almost right away, was politics in general. While there is something quite interesting in using modern politics as the basis of a game (one election, or even better, a political dynasty game could be quite fun to play), the menace of the barbarians from Republic of Rome is missing and the players do not really have to work together. For the core idea to work, there needed to be a strong reason for the players to work together, something that they would not be able to do by themselves but nonetheless a way to establish a single winner. In other words, there has to be a central menace, something that is bigger than all the players. Well, I have a theme/setting in mind and some rough ideas about the mechanics I want to use. Since I am doing this live (and frankly, as an additional motivation to see this project through), expect things to change or for me to change my mind on many aspect of the game. It should make for some interesting reading at least, if not an interesting game. Join me next month when I explain my theme and setting.